Albert Einstein once said that the most powerful force in the universe is compounding. Just as in finance, this is true for managing a manufacturing operation. New problems, big and small, arise everyday. When a problem goes unresolved, it behaves like a disease on your productivity. Additionally, new problems are added to old ones, which creates a snowball effect, and thus the compounding dynamic takes effect. At some point in the life cycle of a manufacturing operating, it takes what Grant Cardone calls "massive action" to reverse this momentum and get into a position where compounding is working in your favor. To do this, you must develop a thorough understanding of what specific wastes are driving inefficiency and pick them apart with well orchestrated and massive action. The 85/15 rule (a variation of the 80/20 rule) definitely applies here. In other words, 85% of your inefficiency is probably being driven by 15% of the issues. The key is to systematically identify the 15% of issues and prioritize the fewest number of initiatives needed to eliminate 85% of inefficiency, which will result in substantial profitability increases. Prioritizing is the act of deliberately ranking needed activities, then allocating time and other resources in the order of greatest to least significance. Prioritize is the 3rd Phase in the Percent Perfect Methodology® (PPM), which identifies the 3 - 5 tools and initiatives needed to capture the greatest gains toward achieving your operating potential. In Phase 1 of the PPM, we looked at how to define perfection for a manufacturing operation. In Phase 2, we reviewed how to Assess where you are in your journey to Operational Perfection (OP). In this phase, we look at how to determine which specific initiatives will have the greatest impact on closing the gap between current state and perfection. There are hundreds and perhaps thousands of Lean Six Sigma and other Continuous Improvement tools out there to be applied depending on the specific application. In fact, any repeatable activity that makes a process more efficient can be classified as a tool, which makes the list virtually limitless. The challenge is knowing a) which tool(s) should be applied and b) how to most effectively apply the tool(s) selected. Just like a mechanic needs to have the right tools for a given job and know how to use them without completely mucking up the project, so do manufacturing leaders. This takes resourcefulness, knowledge, and skills - which are all a function of having the right quantity and quality of experiences. You can identify the appropriate tool to apply based on the type of waste that is occurring. The 8 lean wastes are: defects; overproduction; waiting; non-utilized talent & ideas; transporting; inventory; motion; and excessive processing. Step 1: Determine what perfection would be for your manufacturing operation. Use the Factory Operating System (fOS) to achieve this. It's a free tool and provides the best way to set and establish your theoretical maximum productivity levels. Step 2: Analyze where you are in your journey to Operational Perfection. The fOS will also help you complete this step. It provides a user-friendly interface to track, aggregate, and report production performance. It also helps to cultivate employee motivation around CI by disseminating success stories such as personal records and breakthrough performances across your manufacturing network. Step 3: For each of the three significant types of loss (availability, throughput, and yield), further categorize each type into the 8 wastes. Step 4: Quantify the total losses being driven by each type of the 8 wastes and perform a Pareto Analysis grouped by type of waste and total annualized losses (in dollars or other currency). Step 5: Select the set of tools or processes that are best fit for eliminating or reducing the types of wastes that are resulting in the greatest losses. The objective here is to identify the fewest number of tools that will cut waste to within 15% of Operational Perfection, which is widely considered to be World-Class execution. For example, motion waste is best address through time and motion studies; and transporting waste is minimized through process layout re-design and a technique called Point of Use Supply (POUS) among others. Step 6: Develop the specific initiatives needed to best leverage the selected tools for maximum effect. This may mean customizing or combining tools to refine an ideal set for your specific needs. Once you've gotten this far, you've won more than half of the battle. Abraham Lincoln once said that "If you give me 6 hours to cut down a tree, I'll spend the first 4 sharpening my ax." After Phase 3 of the PPM, the axe is razor sharp and you're just about ready to deliver a swift blow to your manufacturing operation's inefficiency. Unfortunately, many companies skip this phase and consequently, this is where they go wrong with their CI program implementations. Instead, they often mistakenly approach it as either a beautification or fire-fighting program. They start with something like 5S because it's very visual and friendly or they go with problem-solving / kaizen events just so they can pull their CI resources into the weeds of daily operations with them. This isn't necessarily a bad thing, it's just not the most effective use of time and resources. They rarely take the time (and it usually doesn't take much time) to assess exactly where the greatest gains can be achieved, then prioritize effort and resources. As a result of this and other factors, 70% of improvement programs fail in their first couple of years according to a study completed by the McKinsey & Company consulting firm. Furthermore, having the prioritized list of initiatives on hand helps to recruit / promote the ideal talent for manufacturing leadership roles. For example, if your greatest opportunity for improvement is to reduce changeover times, the optimal talent for a director or plant manager role would have a tremendous track record for implementing the SMED tool (Single-Minute Exchange of a Die) for minimizing changeover times. You can see how having a rock solid CI playbook changes your entire approach to how you play the game. Can you imagine how many major decisions are made everyday without taking any of these factors into account? I can assure you that the powerful dynamics of compounding are either working for or against you. If you're not taking deliberate action to leverage this phenomena to your advantage, then it's most likely working against you. The key to changing the trajectory of your manufacturing operation's performance is to prioritize the small set of CI initiatives that will produce the greatest impact on closing the gap to Operational Perfection. Defining perfection provides the North Star for manufacturing leaders to navigate the complex maze of day to day manufacturing operations. Assessing the current state helps you to gauge exactly where you are in your journey. The fOS tool at http://factoryoperatingsystem.com is the best tool available to define and assess where you are against operational perfection on an ongoing basis. Finally, prioritizing provides a clear and executable roadmap to World-Class execution. From here, you have laid the groundwork to capture rapid gains in productivity and profitability. 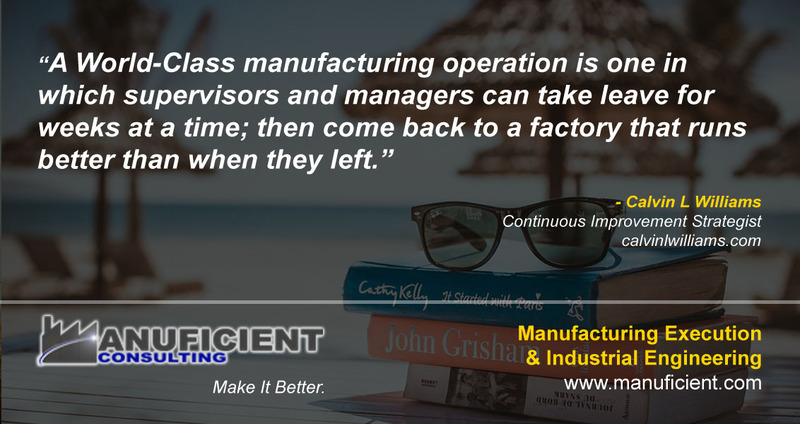 A manufacturing efficiency expert such as those at Manuficient can help you to prioritize your CI initiatives and gain immediate results in performance.